Yoka Sara is an architect known for his experiment with various designs based on vernacular architecture, exploring local materials from the surrounding that are not being paid much attention. Nonetheless his works are much appreciated internationally. Sara also created several building structures from bamboo for music performance stage, sculpture works, aside of house elements. Last year he built a sculpture with structure made of used wooden chopsticks, the joints were glued using used cigarette filters he collected from bins in restaurants and dumpsters in Denpasar. He placed the work by the beach, and not long after it was installed, the sculpture was destroyed by two dogs fighting nearby it. 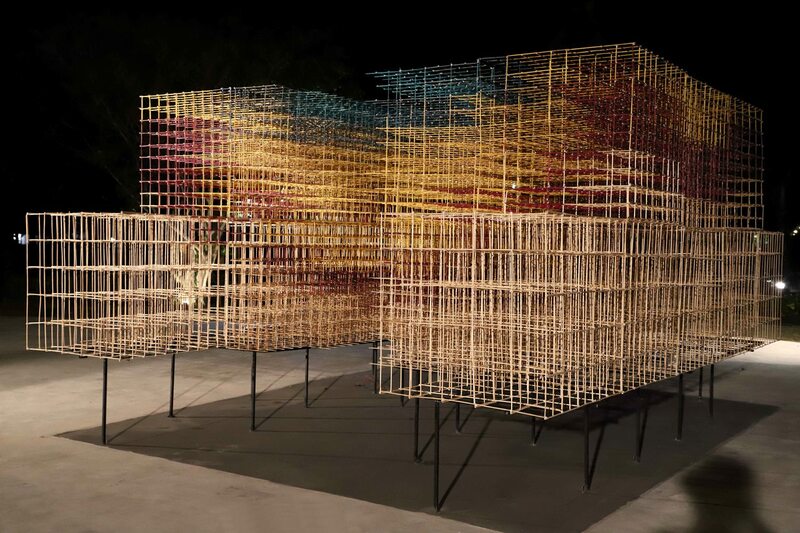 From the same materials and technique he presented a work titled "Bhinneka Tunggal Ika" (2018) in the form of square structure with colors applied on some of the chopsticks, creating color gradation on the inner part of the structure, especially when under the light of sunset. Two masses divided by the sun trajectory line, reflecting the equator line with 23 degrees angle from the earth rotation to the sun in one year. The work is inspired by the phenomenon of netizens behavior on social media that has impact on the issues of the national ethics.